Throughout economic weather changes there is a definite need for building owners to keep their properties attractive to the real estate market. Keeping sites occupied throughout cyclical conditions is a key to success. But that goal is often difficult to achieve, requiring significant expense, and the need to predict market trends. It's safe to conclude, however, that with rising costs of land and new construction, the ability to transform older, lower-height buildings into modern high-ceiling facilities, is an increasingly valuable option. Space Technology Inc. (S.T.I.) provides the real estate industry and building owners with a unique technology and service. 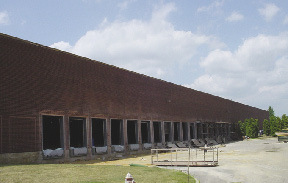 Using the patented E-Z Riser process, all or part of an industrial building roof can be raised to two or three times its original height. This can double or triple the storage capacity of a warehouse, for example, quickly and inexpensively. The entire roof (or just a section of a roof) is lifted as a single unit. Lighting, sprinkler system, wiring, HVAC ductwork and roof-mounted equipment remain undisturbed. 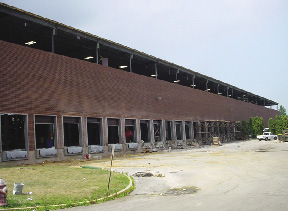 Even the roof of an occupied warehouse can be lifted without any serious work disruption. The actual roof lifting process can be completed in as little as a single day. Clients gain increased size, efficiency and building value without demolition costs, without increasing taxes based on square footage, and without increasing the facility's parking space requirements. S.T.I. 's roof lifting service and technology can transform an obsolete building into a modern, high-clearance facility, virtually overnight. Recently, Forsgate Industrial Partners, a major New Jersey real estate developer, initiated two impressive renovation projects to strengthen its standing, anticipating difficult economic conditions ahead. Alex Klatskin and Steve Seiden of Forsgate met with Jeff Allen of S.T.I., and decided to implement this strategy to assure that their buildings will continue to stand out from the crowd of available sites. Recent trends toward taller warehouse space have rendered the old 24' standard as outdated. With modern forklifts, users have been clamoring for 32' and 36' clear. According to the informative website, www.Rooflift.com, Space Technology Inc. of Uniondale, N.Y., has been implementing the patented "E-Z Riser" process for lifting the roof of industrial buildings nationwide for over 20 years. Demand has grown even stronger in recent years. S.T.I. 's projects often involve structures that are already 20' clear or more, and are being lifted to "keep ahead of the curve" in response to the increasing need for, and economies of, added height. Forsgate enlisted S.T.I. to lift the roof of their recently acquired 222,000 s/f property in Cranbury, N.J. The original 27' height was increased to 40' clear, making it a natural magnet for any warehouse users seeking maximum efficiency. The unique process lifted the existing roof structure, including lighting, heating, and sprinkler systems, by 1' per hour. The process is so safe and smooth that the owners were inspired to demonstrate their new offering by hosting a lunch reception held within the building, WHILE the lifting procedure took place. Attendees were treated to the unique vision of seeing the structure expand before their eyes. As a result, the building now has 2,889,744 cubic feet more interior space, all within its original footprint, and without replacing the original roof or structure. For the owners, it was a remarkable opportunity to expand their property's useful storage space by almost 50%, at a cost of less than $10 per s/f. Its favorable location, with its outstanding capacity, should fulfill the goal of remaining attractive well into the distant future. This was not the first time Forsgate utilized this technology, nor will it be the last. They previously had S.T.I. 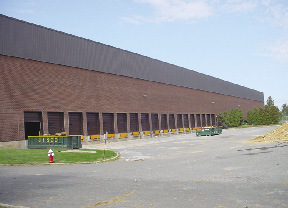 lift the 60,000 s/f roof of their former Nabisco site in Teterboro, from 12' up to 30' clear, which enabled them to attract a new tenant. While completing the current project in Cranbury, S.T.I. is also lifting their former Hyundai site in Jamesburg, for a similar revitalization. That 305,000 s/f roof structure is being lifted from 26' up to 40' clear. Forward-thinking developers are using roof-lifting to attract tenants to their vacant properties. Some are utilizing it to seek out new acquisition opportunities. Others are employing it to retain tenants who have outgrown their OCCUPIED buildings, where the procedure is performed without disruption to ongoing warehouse operations. Like Forsgate, they are finding Space Technology's roof lifting process to be the key to updating their properties and improving their position for a healthy future. As stated on STI's website, www.Rooflift.com: STI provides all the resources needed for a quick, cost-certain solution to a complicated problem. It enables owners and buyers to take an obsolete building -- one that may be empty, or may have cramped, unhappy tenants ready to vacate it -- and turn it into a valuable modern facility. The first step is to run the numbers. STI offers to calculate how much vertical space can be added, how much it will cost, and how quickly the job can be done, free of any initial charge. Their preliminary proposal enables potential clients to calculate their payback. When they see how quickly the investment in vertical expansion pays off, their decision is often an easy one. Anyone with a building that is imposing a low ceiling on its efficiency, profitability or marketability is advised to contact Space Technology Inc. for a free cost estimate.